Phase I of the North Sarah Redevelopment celebrated its grand opening on October 16th. 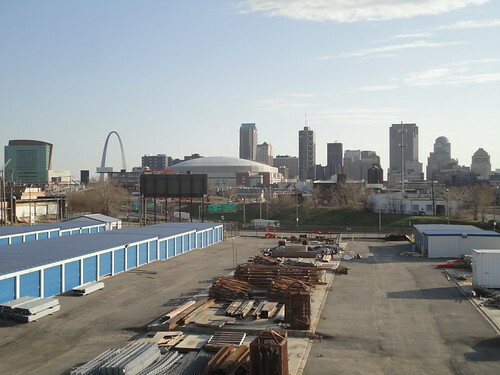 This is a project that I have written about in the past, and the type of development that we definitely need more of in the City of St. Louis. In the press release that followed the grand opening of Phase I, it was revealed that a grocery store would be one of the development’s retail tenants. 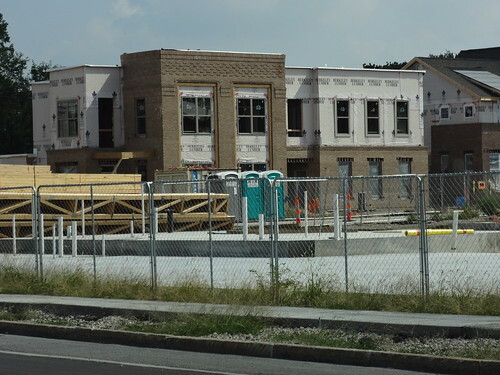 The community includes a mix of two and three-story buildings, plus almost 12,000 square feet of commercial, management and community space, which will include a small, locally-owned, fresh food grocery store. The developers here also demonstrated an extremely encouraging understanding of the community’s 21st century needs. While Phase I is still getting its finishing touches, work continues on Phase II. This work is apparent on the west side of Sarah between C.D. Banks and Finney, and along Vandeventer between W. Belle and Finney. I was hoping that this phase would include at least one renovation. Unfortunately the home pictured below has been demolished. Several Homes North and West of Turner Park appear to be headed for demolition as well. I truly hope that the urban character of the development is maintained as it expands into Phase II. 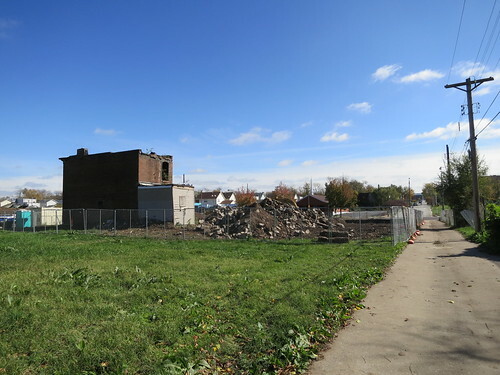 Although I have no idea what the next phase will be like (hopefully not like the new strip mall on Vandeventer between Finney and Cook), some clues can be gathered from the newly launched website for the development. Check out the rendering’s redevelopment of Turner Park. 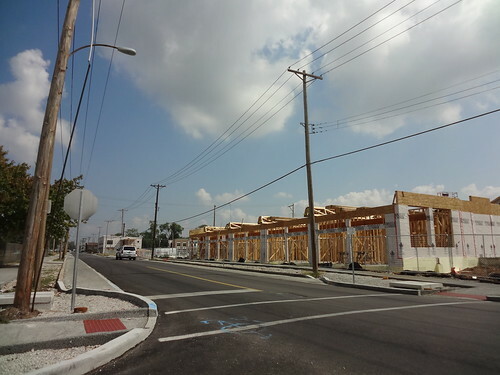 I hope that the developers are working with the neighborhood’s existing residents on this. It would be a shame to remake the park into something that nobody would use. See my photos tracking this development’s construction here. 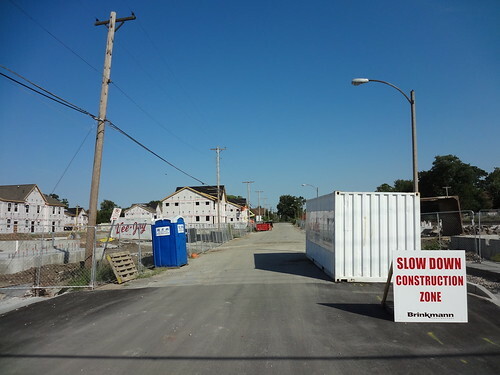 Construction on an exciting new development is underway in North St. Louis. 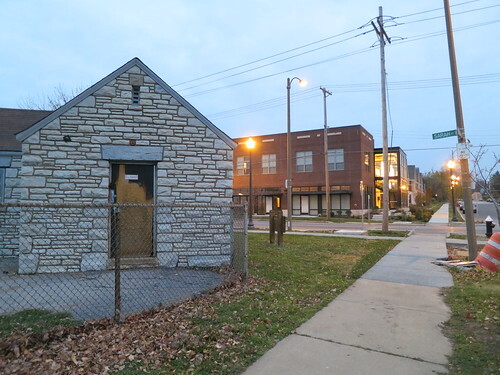 On the east side of North Sarah, between Belle and Cook, what was recently urban prairie is now being transformed by St. Louis based McCormack Baron Salazar Development. 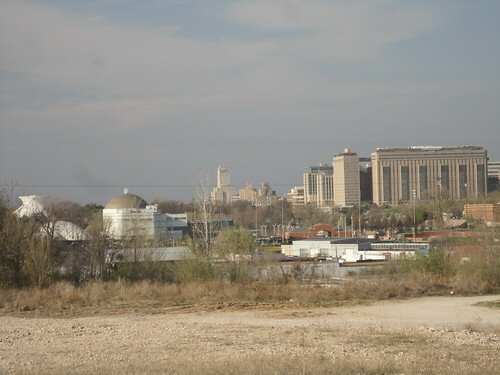 The area in question here was once the Sarah-Finney Business district. In Ain’t But a Place, Miles Davis reminisces about the area. Luckily the area is going to have some business activity returned to it. 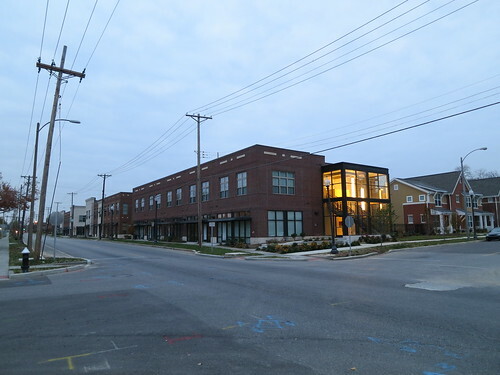 Unlike almost every new project that I have seen in North St. Louis, this one includes mixed uses: both residential and commercial spaces. 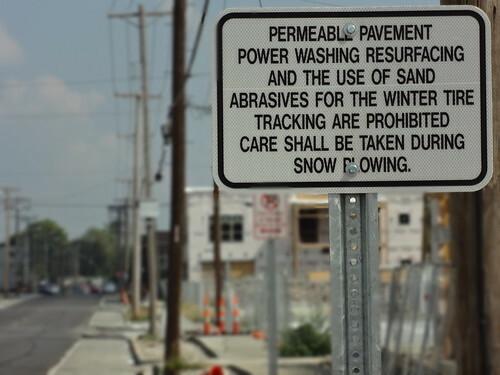 The project also makes use of green technologies such as permeable pavement for the sidewalks. Building setbacks are pretty much non-existent on the buildings to contain commercial space, and quite small on the residential buildings. Density appears to be relatively high, and parking looks like it will be hidden behind the residences, but also allowed on-street. Each intersection has eight curb-cuts and well marked crosswalks. The pedestrian experience has not been overlooked here. Directly across Sarah from the southern half of the development is Turner Park, home to a softball field and playground. 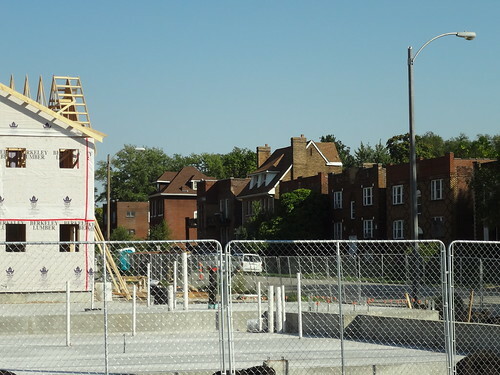 Along the southern edge of development on Belle is an in-tact block of the kind of homes that make St. Louis what it is proud to be. 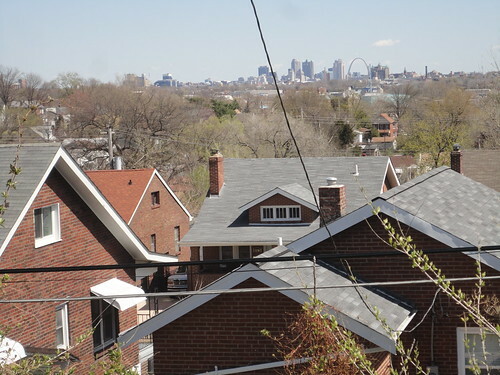 Sarah is a key connector to the north side, and activating this corridor is a great step toward inviting St. Louisans into the north half of their city. With the success of the Gaslight Square redevelopment to the south and close proximity to everything in the city, I am extremely optimistic about this project. 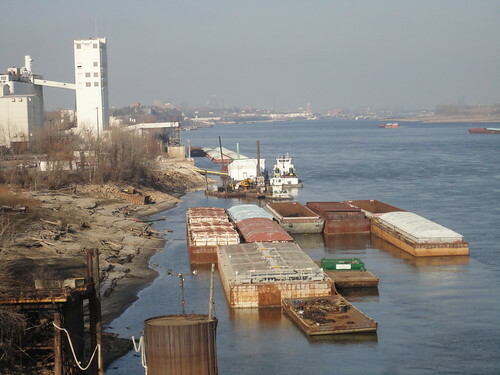 Even without these advantages, however, the good urban planning involved makes this development a great asset to the city, and will hopefully set a good precedent for future ideas.